Am 25. Mai 2014 bestand Boma unter der deutschen Richterin Frau Karin van Klaveren in allen 8 Kategorien mit der Note "A" seine uneingeschränkte Zuchtzulassung. Boma ist ein sehr aufgeschlossener freundlicher Rüde der die Nähe des Menschen sucht und genießt. Vom Wesen her ist er gelassen, sicher und neugierig. Schreckt vor nichts und niemanden zurück. Beim Stockmaß nehmen und in der Einzelbeurteilung stand der junge Mann vorblidlich still und ließ alles mit sich machen! So standen wir 2 in der prallen Sonne und genoßen den Moment! Beim eigentlichen Wesenstest bewies er sich ausgezeichnet. On the 25.May.2014 Boma passed his unrestricted breeding examination under the German examiner Mrs Karin van Klaveren. In all eight catergories Boma obtained passes at "A" grade. Boma has a warm, friendly, curious and open nature, is calm and enjoys close human contact. He is very well behaved around strangers and is also very good with and likes children. Also Boma has no fear and is very confident. Head: Masculine with very pronounced wrinkling. Jowls, cheeks and ears hang correctly. His eye colour matches to the colour of his coat. Chest: Very pronounced prosternum and good depth of chest. Tail: Correct position and alignment with perfect length. Paws: Very nice bone structure. Frontage: Straight posture and gait. Leg angulation: Excellent in both fore and hind legs. Movement: Powerfull movement with good thrust in his step and excellent coordination. 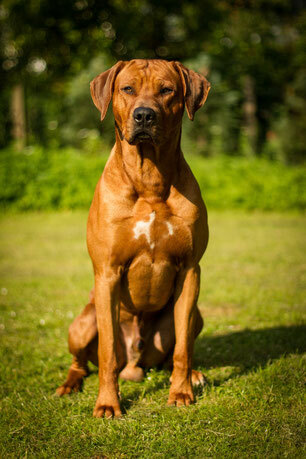 Overall impression: Masculine dog with very good size, proportions and substance. Friendly with safe behaviour. During the gunfire test Boma showed absolutely no adverse reaction and remained calm, confident and focused throughout. We are very happy and proud of Boma's results and enjoyed every minute of the experience during the examination process.